When I go to museums, I often take photos of extinct animals (some of which are alleged to exist in isolated places). I've also found old pictures and colour plates in turn-of-the-century encyclopaedias and Victorian/Edwardian natural history books. Rather than keeping the pictures to myself, I've created these pages for other people to enjoy and included information about each creature. This isn't a specific project, but more photos and more categories may be added if I see something interesting in a museum. This page has been split into an index and sub-pages to aid loading time. Each animal page opens in a new window. The animals on this pare are just a few of the recently extinct species whose demise could have been avoided. You can read about other recently extinct animals in some of the books below. The thylacine in particular is discussed on cryptozoology forums in relation to claimed sightings. 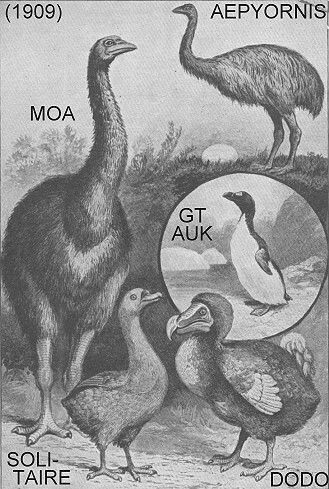 Describes and illustrates (paintings/drawings, no photographs) extinct animals in the last few centuries including the elephant bird, moa, thylacine, quagga, warrah, subspecies of wolves, bears and others. Reconstructs the form and habits of the dodo, thylacine, great auk, smilodon, irish elk and mammoth and investigates their extinction. Includes stills from the British TV series of the same name. Includes recent claims of thylacine sightings.